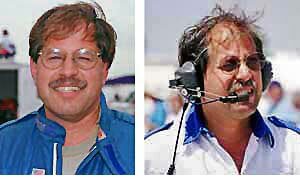 At left is a shot of Rick Kopec I took at SAAC-23 in 1998. But I didn’t have a photo of Iceberg Mike. Rick very graciously stopped everything he was doing to promptly comply with my request (see portrait at right). Sigh. Thought you would enjoy this repartee regarding the upcoming SAAC-27 GT350 vintage race. Mike Eisenberg is one of the big time race car preparation guys on the west coast. He’s not scaring me off. Two transporters worth of the east coast’s fastest vintage GT350s will be coming west in July. So far there are 46 cars entered in the GT350 race. It’s going to be quite a show. Feel free to use any of this that you want. These cross-continent missives began in late April. It is my opinion that all of us in SAAC are on the same team. When I think of you and all the other members from the wrong side of the country, I see friends in arms, comrades, compatriots, brothers! I would like to say that all of us on the left coast have the same warm and fuzzy feelings for you and your kin. But, alas, I am hearing rumors that all may not be wine and roses. It is with all due concern for your welfare and self esteem that I must warn you about the possibility of an impending ambush by some of the so-called gentleman racers who reside in our fair state. I personally am not privy to any details, but I’ve heard that some of these rocket jockeys are planning to send your bravest and finest racers scampering back to momma after administering the appropriate shellacking in the vintage races. I hope and pray that its not true, but I feel compelled to warn you. Heaven help us all if my feelings of impending doom are based in reality. Thank goodness it’s not too late to save yourselves. If I were you, I would find some reason not to come. At least not with your race cars. Any half-hearted excuse will work. You had a late freeze and your block cracked, there was an overturned cattle truck in St. Louis and the expressway was blocked, You were ambushed by Pancho Villa outside of Alamogordo, ANYTHING WILL WORK. I beg you, save yourselves from an almost unbearable humiliation. The type of humiliation that scars the psyche for an eternity. The type of humiliation that your children’s children will have to bear. Thank you so much for the heads-up. I realize that there has never really been a real honest-to-goodness, East-West face-off. I think there needs to be. A couple of guys were sent to Lime Rock for SAAC-25 as sacrificial lambs, just to take a measure of the competition. They reminded me of a field mouse that is put into a boa constrictor’s cage as its food. The snake needs to eat only once every couple of weeks so the poor little mouse spends all of his time shaking like a leaf, its heart beating a thousand times a minute and its eyes never leaving the snake. This goes on day and night until the mouse’s nerves are shot and he is, for all intents and purposes, numbed. When the snake finally eats him it is actually a relief for him (editor: the mouse… and the snake). I’m sure that’s how those guys felt at Lime Rock and, all things considered, they were probably grateful to pack up and leave for their 3000 mile trip west, their raw asses hanging out the back of shredded pants. I’ll bet it was a very quiet ride home, too. In fact, after their being ground into the pavement, I am surprised at the number of race entries for SAAC-27. Could it be that the west coast racers who came to SAAC-25 were beaten so badly that they have psychologically blocked the entire incident out of their minds? That must be the explanation. It was so embarrassing that they came home and told no one. So now, in a mere 2-1/2 months, history will repeat itself–except that it will happen in front of the entire west coast Shelby contingent. This could be a psychological disaster that could result in a mass selling of race cars and the ex-owners all taking up ballroom dancing or collecting CDs of show tunes. We can’t let that happen. I’ve held a meeting with all of the guys who will be coming west to race. I leveled with them. I said that if they came out there and blew everyone from the west coast into the weeds those guys would never again enter a vintage races at a future convention. I made each of them promise, swearing on their Shelby owners manual, that they would go only as fast as it took to win. No leaving the west coast cars a lap down. No showing off, cutting lap times so fast in practice that everyone else would discover serious mechanical problems which would keep them from making the race grid. No taking the first 8 grid positions in the race. It has to look close so that in 2003, when SAAC-28 is back at Lime Rock, those west coasters will be salivating for a rematch. Victory will be so close they can taste it. All that said, if there are any west coast Shelby racers who are unsure of their cars–and their manhood–there is a perfectly acceptable alternative. There just happens to be a vintage race in Seattle that same weekend and they can always tuck their tails between their legs and head north, like the Edelbrocks who have already shown some common sense. That’s probably preferable to being pummeled into hamburger and then reliving the defeat over and over again in flashbacks every time they hear an unmuffled 289 engine. I believe this is called “Post Traumatic Stress Disorder” (PTSD) and it is the equivalent of hell on earth. Former racers never getting out of their Nomex suits, moving around slowly as if in a trance, mumbling to themselves and then jumping practically out of their skins when a race engine barks to life. This is followed by severe shaking and sobbing. It is almost too horrendous to contemplate. Maybe we better let somebody finish 4th or 5th. See you in July. It occurred to me after reading your reply to my email that you can’t see the handwriting on the wall, your crystal ball has a cataract, your sense of reality is distorted by sniffing to much Castor oil (ed: Castrol? ), you have your head stuck in a pile of Goodyears. I tried to give you the best advice I could. I’m trying to be the voice of reason that helps you understand just how dire the circumstances are that you are subjecting yourself to. Need I remind you of SAAC 22. How quickly you forget how the West Coast GT350 racers trounced their East Coast brethren. Annihilated. That would have been the defining moment in Shelby history if you hadn’t managed to so conveniently forget the details. Carroll Shelby @ Monterey Historics 1997; you were a footnote in some insurance adjusters memo. You will see your reign as head mascot end in doom just as surely as Napoleon fell at Waterloo(editor’s note: Napoleon didn’t just fall… he got blownaparte). I just hope that the Shelby Doc makes house calls in Fontana. His counseling may be the only thing that gets your whimpering broken psyches back to where you came from. I think what you’re demonstrating here is a classic case of false bravado. One of the mice walking around thumping his chest and talking big when he knows that the cat is out in the back yard. But when the cat shows up, the mouse quickly disappears into that hole in the wall. You’re whistling past the graveyard and that won’t disguise the fact that you’re scared down to the curled hairs on your ankles. But I want to show you (and all the rest of the left coasters you seem to be speaking for… you know–the tough guys who suddenly seem to have lost their voices…) that even though they are going to get beaten like rented mules, we are not cruel and heartless. We understand that they have wives and children they will have to face after the race. They will be so far behind that they will not see the checkered flag when the winner crosses the finish line but they will leave the track with their dignity intact. Well, a little of it, anyway. That much I promise you. Here’s what we’ll do. We’ll have the usual 1st through 4th place finish trophies. But we will also have some additional awards that we can present to some west coast racers so they will feel that at least they got SOMETHING for their efforts. Let’s face the facts, Mike: you guys are going to finish so far back that everyone is going to think your cars are part of the track’s fleet of maintenance vehicles, coming around before the next race to clean up debris from the track. How would you guys feel about getting a one-lap head start? Then those little kids watching their fathers would see them finishing on the same lap with the East Coast cars and wouldn’t get their little hearts broken. We’re also thinking about giving the police of each California driver’s hometown the names of the drivers so they can be put on suicide watch after they get home. See? We do have a conscience. PS: anyone need maps to Seattle? Monterey? I’m glad you asked. 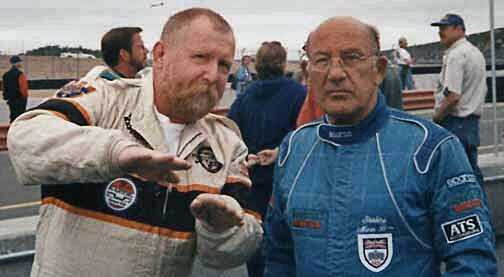 Saturday 16 August, 1997: Here’s a photo of me giving Sir Stirling Moss a couple of driving pointers at Monterey (editor: one readily discerns that Sir Stirling is transfixed by Rick’s Driving Tricks). ‘The track official you see in the backgroud are scouring the horizon in a futile attempt to determine if ‘Iceberg Mike’ ever showed up. I sense a rift in our Shelby family. The West Coast Shelby vintage race community is looking forward to welcoming the East Coast racers in a friendly good-natured test of skill and daring. But your irrational rants and raves indicate that you see yourself and your confederates as some sort of lowlife street thugs on a mission to turn SAAC vintage races into an East Coast Mafioso massacre. But there is one miscalculation in your plan: you talk the talk, but you can’t walk the walk. You can say “Bada-Bing, Bada-Boom” until you are blue in the face, but all that hyperbole doesn’t make up for your lack of skill. Your whole premise of superiority is built on a house of cards. The truth is that you are suffering from deep-seated paranoid schizophrenic behavior that manifests itself in extreme delusions of grandeur. This behavior started when you were a very young child. You fantasized about performing heroic deeds at the time of the birth of our nation. In fact, your hero was an ex-Englishman silversmith named Paul Revere. They taught you in school about Paul Revere and his midnight ride to warn the New Englanders about the arrival of the British army. Unfortunately, as a child you had a hearing impediment. When you were told that Revere said “The English are coming, The English are coming”, you heard “My engine is running, My engine is running.” You were so smitten with the heroic acts of Paul Revere that after school you would ride around your neighborhood in! your red Radio Flyer (suitably equipped with graffiti-quality white LeMans stripes) pretending to save the colonies. But alas when you tried to yell “My engine is running, My engine is running” all that came out was this unintelligible screeching noise. You see you also had a speech impediment, and you couldn’t say anything understandable. You found it easier to just flap your lips and make buzzing sounds. Well, old habits die hard. Now you anxiously await every 4th of July weekend so that you can relive your past dreams of heroic patriotism. But in your muddled confusion, you are pretending to be a different ex-Englishman named Ken Miles (who amongst his myriad better-known accomplishments included service as a British 8th Army tank driver doing battle with Rommel in North Africa. Hence yet another heroic icon for you to incorporate into your carefully-staged persona). You are still trying to proclaim “My engine is running, My engine is running”, and still all you can do is flap your lips and make buzzing sounds. My suggestion to you is to come to Fontana to enjoy our hospitality. But try to be inconspicuous. Learn to blend in. Take speech therapy treatments. Go to a tanning salon. Take driving lessons. Leave the leather jackets, overcoats and brass knuckles at home. And for cryin’-out-loud, STOP FLAPPING YOUR LIPS. I speak for all of your West Coast Shelby brethren when I say that we are all looking forward to showing you a good time at SAAC 27. It is a shame that you have unwittingly become a stooge for those evil east coast Shelby thugs; I’m endeavoring to set the record straight. You’ll find a couple of photos of me; you see, folks might not recognize me from the mug shot that “Ricky” submitted to you. One photo is of me performing my Crew Chief responsibilities. The other is of me driving at Road America in 1994, where I was fastest qualifying Shelby, and finished second to another West Coast Shelby. I think the East Coast Shelbys were to scared to run to the front. It’s funny though, the same happened at Road America and the Monterey Historics in 1997 during the All Shelby races. Perhaps there is a pattern here. Your readers should also take note that while I participate in Historic races, Kopec engages in histrionics. Just an observation. Also find attached a photo of Kopec on (what is today) his pit vehicle, a relic from his youth. 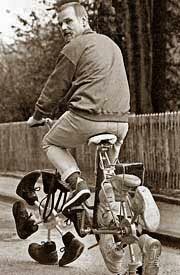 It’s a photo that a SAAC operative surreptitiously removed from the Kopec family album. You’ll see (then) 17-year-old Rick putting his best feet forward, taken in 1958, with a note scribbled by his mother. Mike in his GT350 at Road America in 1994. Flash: SAAC Headquarters, Sharon, Connecticut U.S.A. I have received suggestions from several west coast members that we not make place finishing awards and, instead, draw numbers out of a hat for 1st through 4th Place trophies. Another west coast suggestion is that we not allow numbers on any cars and simply give everyone a small trophy for participating. We will take these ideas under advisement. Everyone back here is looking forward to seeing their west coast brethren and getting out on the track. We have been looking for some type of appropriate memento for everyone who participates, and we’re presently getting a price quote on some pretty nice windshield ice scrapers. Sidewinder Tip#1: you can instantly find/return to this ‘Kopec/Eisenberg Pleasantries’ page by just using Sidewinder : for example, type <Kopec> or <eisenberg> or <humiliation> or even <friggin’ field mouse> into the ‘Sidewinder’ search box.